If your association complies with various data protection and privacy regulations, you might need to give your constituents the ability to be "forgotten" by your organization. You should give them a clear action to be forgotten, and let them know when to expect that action to be completed. There are many ways you can configure requests to be forgotten in Community Hub, but there are some included components to get you started. The card you can place on any page to inform constituents they can request to be forgotten and contain the Forget Me button. Cookie Message Success Card The card you can place above the ForgetMe card to display the message set by the Consent Not Provided button. Constituents can press if they want to be forgotten. The button sets a cookie message letting constituents know their request to be forgotten is being processed, and how long it might take. 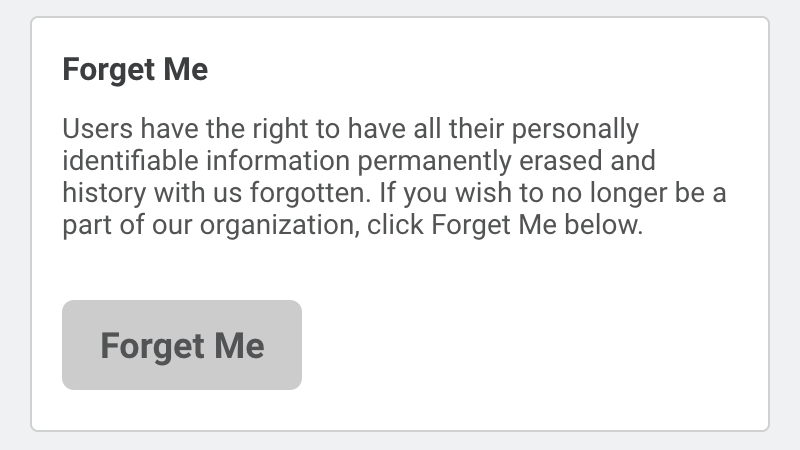 Place the ForgetMe and Copy of My Data Request cards on a page(s) where you would like constituents to be able to request to be forgotten. We recommend placing them on a page where they can manage their privacy settings, like a My Privacy Settings in Community Hub. This is just one way you can set up requests to be forgotten in Community Hub. You can create your own components to customize the experience for your constituents, just be sure that whatever approach you take complies with the data protection and privacy regulation(s) to which you are adhering.